Sara vs Annie vs Katrin. Who do you think will win? 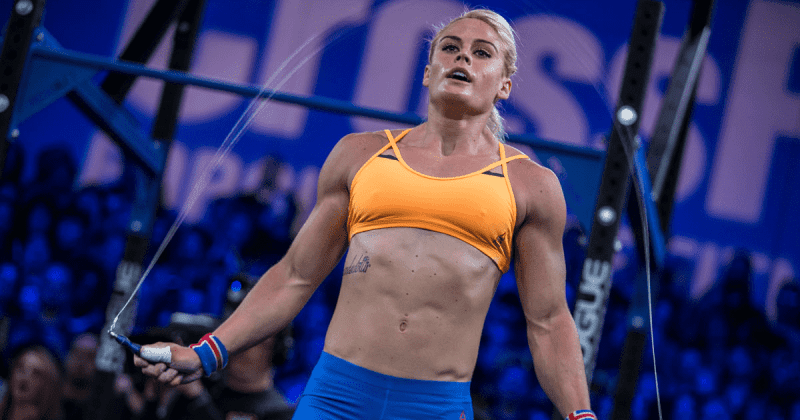 Returning from injury for the CrossFit Open Workout 18.5 live announcement, Sara Sigmundsdottir is going to battle against her fellow Icelandic athletes, Katrin Davidsdottir and Annie Thorisdottir. Dave Castro will reveal the winning workout at the announcement of 18.5 on the 22nd of March in CrossFit Reykjavík in Iceland. Ragnheiður Sara, or Sara Sigmundsdottir as most people know her, is a 25 year old Icelandic CrossFitter, one of the fit dóttirs. She has been at the CrossFit Games three times and her highest place finish was in third place on the podium in 2015 and 2016. She proved herself as one of the fittest on earth and almost got on the podium in 2017 but ended in 4th place. Sara has also been a coach for some time, first at CrossFit Kraftur in Reykjavík and then in CrossFit Suðurnes in Keflavík. She joined CrossFit Mayhem in Cooksville, Tennessee for the 2016 and 2017 season. Sara had a minor setback over these last few month, she broke a rib and had to take some rest for 6-8 weeks. Sara has recovered and her plan is to get back to the Games this year. Her first step is to beat the other dóttirs (dætur) in CrossFit Open Workout 18.5 and qualify for Regionals. Sara Sigmundsdottir was not into sports when she was younger, but wanted to get fit to be able to get a boyfriend, she signed up for a Boot camp class and saw that she was the only girl that could perform push ups. She has worked her way up from there. When she realized that Katrín Tanja qualified for the CrossFit Games, she knew that she could do it as well. This was a really exciting race between the two Icelandic CrossFit Dóttirs. Sara competed against Katrín the year before as well, alongside three people from the Air Force. The gym that they competed in is located on the Air Force base in Colorado Springs, Colorado, which is 1 mile above sea level. This means the oxygen is thinner there than most people are used to. That makes breathing much harder, especially when training.